Delivered by Abeking & Rasmussen in July it was announced just weeks later that 81.8 metre motor yacht RoMEA was joining the charter fleet. As well as her spacious Terence Disdale designed interior, which can accommodate up to 12 guests in six cabins, she has numerous other stand out features including two cinemas, an elevator to all decks, a spa area with massage table, a sauna and a large beach club. Superyacht RoMEA is also now for sale and was on display at the Monaco Yacht Show. 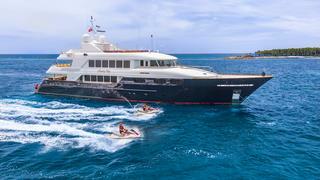 RoMEA is available for charter with a rate of €875,000 per week. Delivered by Abeking & Rasmussen in July it was announced just weeks later that 81.8 metre motor yacht RoMEA was joining the charter fleet. As well as her spacious Terence Disdale designed interior, which can accommodate up to 12 guests in six cabins, she has numerous other stand out features including two cinemas, an elevator to all decks, a spa area with massage table, a sauna and a large beach club. Superyacht RoMEA is also now for sale and was on display at the Monaco Yacht Show. 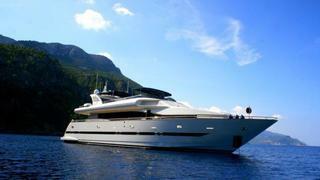 RoMEA is available for charter with a rate of €875,000 per week. In September it was announced that 64.4 metre motor yacht Okto was new for charter for the Caribbean season. Delivered by ISA in 2014 sublimely silent Okto has one of the best superyacht pools, which uses sea or fresh water. Other special features include a touch and go helicopter pad, a guest elevator from the lower deck to bridge deck and four tender garages. The fully custom yacht has accommodation for 11 guests in six cabins and was built for a knowledgeable yachtsman with an emphasis on engineering, production and finish. _Okto _is available to charter this winter with rates starting from $500,000. Okto is also currently for sale. In September it was announced that 64.4 metre motor yacht Okto was new for charter for the Caribbean season. Delivered by ISA in 2014 sublimely silent Okto has one of the best superyacht pools, which uses sea or fresh water. Other special features include a touch and go helicopter pad, a guest elevator from the lower deck to bridge deck and four tender garages. The fully custom yacht has accommodation for 11 guests in six cabins and was built for a knowledgeable yachtsman with an emphasis on engineering, production and finish. _Okto _is available to charter this winter with rates starting from $500,000. Okto is also currently for sale. Previously only privately used Amels motor yacht Lady Nag Nag made her charter debut in the Western Mediterranean this summer. Delivered in 2008 Lady Nag Nag is also currently for sale. She has accommodation for 12 guests in six cabins with a comfortable interior designed by Laura Sessa. The yacht features plenty of areas for relaxation and fun with a full entertainment system, wet bar and games table. She also has an impressive toy box including two tenders, two jet skis, two SeaBobs, inflatable sea kayaks, snorkelling gear and a selection of towables. Lady Nag Nag charters at €245,000 per week. Previously only privately used Amels motor yacht Lady Nag Nag made her charter debut in the Western Mediterranean this summer. Delivered in 2008 Lady Nag Nag is also currently for sale. She has accommodation for 12 guests in six cabins with a comfortable interior designed by Laura Sessa. The yacht features plenty of areas for relaxation and fun with a full entertainment system, wet bar and games table. She also has an impressive toy box including two tenders, two jet skis, two SeaBobs, inflatable sea kayaks, snorkelling gear and a selection of towables. Lady Nag Nag charters at €245,000 per week. After being sold and renamed, Bacchus (previously Chevy Toy) was introduced to the charter market this autumn. Already making her mark in the Caribbean Bacchus quickly secured two 10-day charters for the holiday period. A recent interior refit means that Bacchus can now accommodate 12 guests and she also features a spacious salon, formal dining area and bar. After spending the winter season in the Caribbean Bacchus will be available in New England next summer. 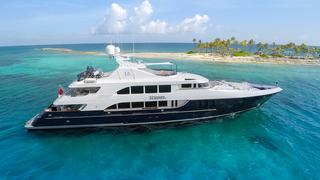 Bacchus is managed for charter by Churchill Yacht Partners and has a charter rate of $150,000 per week in high season. After being sold and renamed, Bacchus (previously Chevy Toy) was introduced to the charter market this autumn. Already making her mark in the Caribbean Bacchus quickly secured two 10-day charters for the holiday period. A recent interior refit means that Bacchus can now accommodate 12 guests and she also features a spacious salon, formal dining area and bar. After spending the winter season in the Caribbean Bacchus will be available in New England next summer. 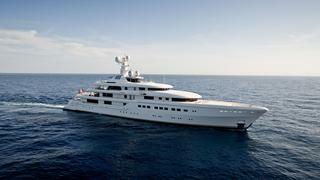 Bacchus is managed for charter by Churchill Yacht Partners and has a charter rate of $150,000 per week in high season. 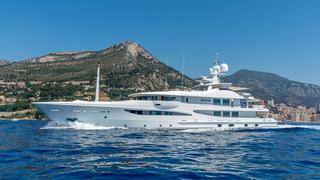 The 31.1 metre motor yacht Something Southern made her debut to the charter fleet this autumn. Delivered by Westport in 2002 she was refitted in 2013 to bring her up to date with all the latest amenities. Something Southern has accommodation for eight guests in four cabins including a master suite with a large bathroom. One of the highlights of the yacht is her versatile flybridge which has a Jacuzzi, bar area and awnings if you want to take a break from the sun. Something Southern is managed for charter by Ocean Independence and has a weekly charter rate of €49,000. 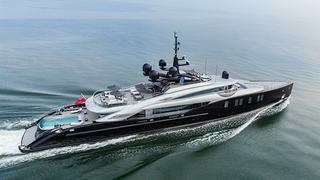 The 31.1 metre motor yacht Something Southern made her debut to the charter fleet this autumn. Delivered by Westport in 2002 she was refitted in 2013 to bring her up to date with all the latest amenities. Something Southern has accommodation for eight guests in four cabins including a master suite with a large bathroom. One of the highlights of the yacht is her versatile flybridge which has a Jacuzzi, bar area and awnings if you want to take a break from the sun. Something Southern is managed for charter by Ocean Independence and has a weekly charter rate of €49,000. New for charter motor yacht Smiles of London is likely to attract attention next summer as she has a Spanish charter licence and will be available in the Balearic Islands from May to October. Built by the Johnson yard in Taiwan she was delivered in 2000. Smiles of London offers comfortable accommodation for eight guests in four cabins and carries four crew. Having recently undergone a refit she makes her charter debut in a pristine condition. Smiles of London charters at rates of €39,500 per week in high season and €37,000 per week in low season. New for charter motor yacht Smiles of London is likely to attract attention next summer as she has a Spanish charter licence and will be available in the Balearic Islands from May to October. Built by the Johnson yard in Taiwan she was delivered in 2000. Smiles of London offers comfortable accommodation for eight guests in four cabins and carries four crew. Having recently undergone a refit she makes her charter debut in a pristine condition. Smiles of London charters at rates of €39,500 per week in high season and €37,000 per week in low season. After an extensive refit 47.35 metre Rebel was made available to charter for the first time in the Caribbean and the Bahamas. Her spacious interior designed by Claudette Bonville offers accommodation for 10 guests in five en-suite cabins equipped with the latest entertainment systems. Rebel is perfect for guests looking to have fun on the water as she boasts an extensive toy selection including three jet skis, three SeaBobs, three SeaDoo underwater scooters, 18 sets of snorkeling gear, six sets of scuba diving equipment and a dive compressor. Rebel is managed for charter by Hill Robinson and has a weekly charter rate of $190,000. After an extensive refit 47.35 metre Rebel was made available to charter for the first time in the Caribbean and the Bahamas. Her spacious interior designed by Claudette Bonville offers accommodation for 10 guests in five en-suite cabins equipped with the latest entertainment systems. Rebel is perfect for guests looking to have fun on the water as she boasts an extensive toy selection including three jet skis, three SeaBobs, three SeaDoo underwater scooters, 18 sets of snorkeling gear, six sets of scuba diving equipment and a dive compressor. Rebel is managed for charter by Hill Robinson and has a weekly charter rate of $190,000. Following a major refit in 2014 Cristobal was made available for charter in Florida and the Bahamas. Built by Princess Yachts the 29.64 metre motor yacht offers accommodation for eight guests in four en-suite cabins. As part of her major refit Cristobal’s sun deck was reconfigured and she now has an open air cinema, Teppanyaki grill, a large bar and plenty of space for Alfresco dining. Cristobal is managed for charter by Ocean Independence and has a weekly charter rate of $43,000. 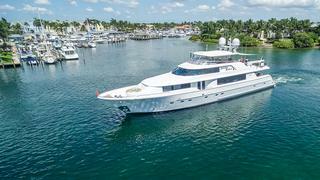 Following a major refit in 2014 Cristobal was made available for charter in Florida and the Bahamas. 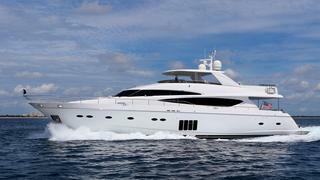 Built by Princess Yachts the 29.64 metre motor yacht offers accommodation for eight guests in four en-suite cabins. As part of her major refit Cristobal’s sun deck was reconfigured and she now has an open air cinema, Teppanyaki grill, a large bar and plenty of space for Alfresco dining. Cristobal is managed for charter by Ocean Independence and has a weekly charter rate of $43,000.